Among the Minoan ruins excavated on Crete were the remains of pottery, frescoes, and other works of art. The earliest Minoan pottery had images carved into the clay. These images were often simple lines filled with simple colors. Interestingly, humans were not portrayed on Minoan pottery. 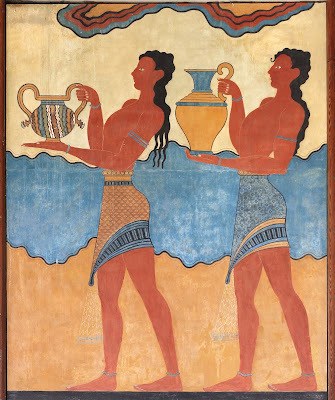 That was reserved for the amazing Minoan fresco paintings. A fresco is a painting done on wet plaster. Ancient Minoan frescoes, in addition to showing plant and animal life, also showed humans. Usually, the humans depicted in Minoan frescoes are engaged in religious activites, including sporting events. Other frescoes give us a glimpse into daily life of the Ancient Minoans. One of the most famous Minoan fresco paintings, found in the ruins of the palace at Knossos, shows an event called "bull leaping." In this sport, an acrobat faces a charging bull, grabs it by the horns, and does a somersault over the bull's back. Since bulls are referenced frequently in Minoan and Greek mythology as sacred, it's not a terrible leap to say that bull leaping was probably a sacred event. 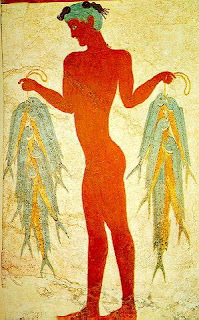 This fresco shows what was probably a very common occupation on ancient Crete, a fisherman. This Minoan fresco depicts two game birds. 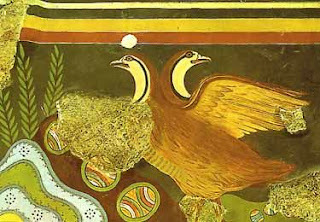 Notice that the placement of the birds gives a sense of depth to the painting. 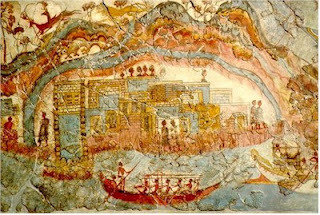 The Ancient Minoan town of Akrotiri is depicted in this fresco. Akrotiri was on the volcanic island of Thera (Santorini today). When Thera erupted, Akrotiri was destroyed. The eruption probably also had a devastating effect on Crete and may have contributed to the ultimate decline of the Ancient Minoans. Minoans were also accomplished sculptors and jewelry makers. Like their frescos and pottery, the Minoans honored nature and showed their daily rituals and lives in their sculpture and jewelry. 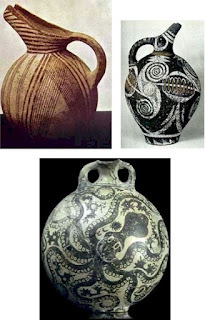 Many more images of Minoan art, including some larger images of the ones shown in this article, are available for viewing here and here.